Whether you’re heading out on a family day hike or a multi-day backpacking trip, you’re going to need snacks. When you’re working hard for a long period of time, your body gets hungry! Fuel yourself well with these 10 healthy hiking snacks. This one’s a classic, but it is for a reason. With healthy fats from nuts and seeds, a trail mix blend will keep you fueled for the long haul. Since hummus is perishable, we recommend this for day hikes. (For a multi-day trip, try crispy chickpeas!) Whether you make it yourself or buy it pre-made, hummus is an easy, protein-packed choice that goes well with veggies or crackers (try these almond pulp crackers). Once you make it to the top, you’re going to want something a bit heartier to fuel you enough to make it back down. You may not want a full-blown lunch though. 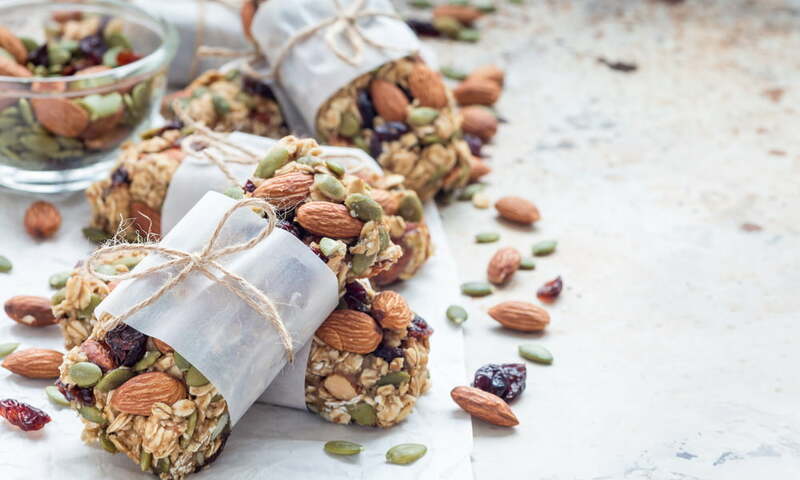 Enter granola bars: loaded with protein and healthy fats, these granola bars will satisfy your hunger, but won’t leave you too full to move. Fat bombs are the dream snack for both day hikes and multi-day trips since they’re light, will keep you full for hours, and are easy to make and store in your bag. If you’re taking multiple fat bombs, be sure to store them in a reusable container so they don’t get squished by your bag contents and meld together – no one wants that. Fresh vegetable sticks are great day hiking snacks, especially because of their versatility. Simply cut up your veggies of choice (i.e. carrots, celery, peppers, cucumbers), pack some dip (if you like), and trek on! A vegan alternative to tuna salad, chickpea salad is ideal when mashed in a sandwich for lunch or served with crackers as a snack. Pack it into a reusable container, bring some crackers or bread, and you’re good to go. Since many healthy hiking snacks are sweet, tuna salad and crackers is a tasty, savoury snack to satisfy you and the whole family. This snack works for both day hikes or multi-day backpacking trips, although be sure to keep it chilled for hikes longer than one day. Never overlook the power of fruit. For a day hike, fruits like apples or bananas will give you that (healthy) sugar rush to make it up that final peak. If you want to pack extra light, try dates or dehydrated fruit! Similar to fat bombs, with a lower fat content these bliss balls are a sweeter alternative for when you need a healthy sugar kick. Make them the night before for ultimate freshness on your day hike. Reliable and steadfast, granola is like the trusty steed of hiking snacks. It’s easy, light, nutrient-dense, and a bag will last for days, so if you’re prepping for snacks in a pinch, granola is the way to go. Along with snacks, be sure to pack plenty of water on your hikes. Water is most important when spending long hours outside and in the sun. Enjoy yourselves, but stay safe out there folks! Find all ingredients at your nearest Blush Lane store! What are your favourite healthy hiking snacks? Let us know in the comments below!